Level 16 is a creepy, impressive exploration of femininity. Have you ever watched The Handmaid’s Tale and wondered what happens to girls born in that society? Girls who never knew the “normal” world? Well, Level 16 may give you an idea. 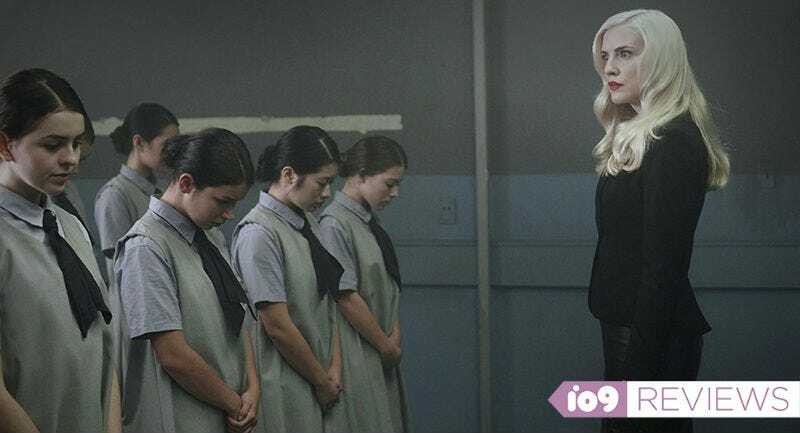 Written and directed by Danishka Esterhazy, Level 16 is an original film, but one that shares more than a little DNA with the hit Hulu show thanks to its subject matter, pathos, and disturbing timeliness. Set in a purposefully undefined setting, Level 16 is named after the final level of a mysterious school for young women. From the very earliest ages, girls grow up and live their daily lives inside the school. They don’t see the sun and they don’t go outside. The school teaches them how to think, how to speak, when to clean, how to act—not how to read. The girls believe they are doing this so they’ll be adopted by nice, kind families. It’s not a spoiler to say that is obviously not the truth of the matter. Things take a turn when Vivien (Katie Douglas) reunites with Sophia (Celina Martin) years after they played key roles in each other’s upbringings. They haven’t seen each other for a while thanks to another school rule that attempts to deny friendship. When they do get back together, though, Sophia reveals a key secret to Vivien and the pair begin to dig into the truth behind the school. This stark, scary setting is what Level 16 is all about. What makes Level 16 so good is that while it’s very much a story about the objectification, disrespect, and suppression of women and femininity, it never feels like the focus. It’s all there, right below the surface, but Esterhazy instead keeps her story squarely on her two leads. Douglas and Martin deliver powerful, nuanced performances and as a result, their rocky relationship grows with emotional resonance. There’s edge of your seat tension, stomach-turning disgust, and cheer-worthy elation as the girls finally start to break their metaphorical chains. The film flies with a steady, strong pace and the visuals are simple but striking. Sara Canning and Peter Outerbridge play the school’s overlords and their menacing performances give the film yet another level of creepy. Danishka Esterhazy has a winner with Level 16, which feels odd to say considering its bleak, upsetting subject matter. And yet, it’s handled with such a deft, expert touch that it educates and resonates while entertaining along the way. Level 16 had its world premiere this week at Fantastic Fest 2018.